Control your Business - your projects and your operations and choose your solutions based on understanding and you will implement your path forward successfully. Pinc - Projects In Control. Providing processes, procedures and functional requirements, we plan your project delivery and deliver to that plan. Ensuring the integrated business processes and project fundamentals are established and supported. Delivering all types of projects from system implementations to large scale resource projects - cost and schedule are the key. 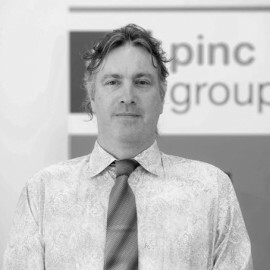 Founded as a partnership in 2005, Pinc Group is a project management consulting organisation based in Northbridge, Western Australia with an office in Canberra. With a strong focus on Project Services, Pinc Group have developed an industry leading in-house Document Management Consultancy as well as a turn-key Document Management Solution. 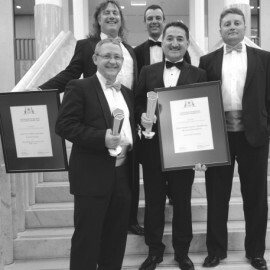 Coupled with their in-house Project Cost Control system and a number of other Services and Control modules, Pinc Group is now placed at the forefront of solutions and process provision across multiple industries working with resources, government and professional clients across Australia and internationally. Pinc Group is involved in major mining and mineral processing projects associated with gold, iron ore, magnetite, molybdenum, vanadium, manganese and chromite ores. We are involved in the development of rail, building, electrical, materials handling and major civil and marine infrastructure works. Pinc Group is also involved in the oil and gas sector assisting both project and operational teams with project services and system streamlining, personnel and training. Our business processes centre around a ‘client integrated team’ philosophy. This allows the client to use their own technical capabilities to collaboratively develop a new project with Pinc Group working internally in the client’s organisation. A project can be viewed as a new mine, an upgrade to existing infrastructure or am IT project to implement Document Management. In essence, Pinc delivers to the client the missing elements; the trained people, project development knowledge and software systems and solutions that give the control needed to successfully develop their assets and internal requirements. Pinc Group can be engaged at any stage during the lifecycle of a project; however we add the most value at the initiation of a project. This ensures that the integrated business processes and project fundamentals are established early and supported by trained people and software. Pinc Group understands that the lifecycle of a project extends beyond commissioning and implementation into a clients operations and use and our business processes and software systems seamlessly cater for this Life of Asset approach. 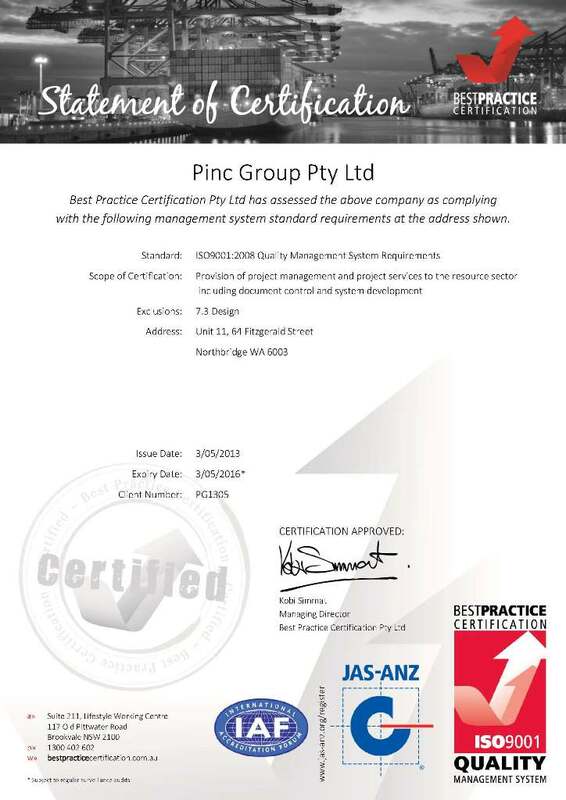 Pinc Group is fully compliant with ISO9001:2008 and brings this compliance mentality to all of it's client engagements. Pinc Group can bring our compliance experience to enable your organisation to prepare for a ISO audit or to achieve certification. Quality Assurance ensures your procedures and processes are auditable, measurable, maintained, reviewed and challenged in order to get the most out of your business in a safe and cost effective manner.